The Monteverdi Choir/English Baroque Soloists/Sir John Eliot Gardiner. In 2000 Easter Sunday fell on 23 April. Fittingly, Sir John Eliot Gardiner and his Cantata Pilgrims spent the Easter weekend in Eisenach, Bach’s birthplace, and gave concerts on three consecutive days at the church where he was baptised and where he was a boy chorister. This pair of CDs contains two cantatas for each of the three days of the Easter festival. Some collectors may already have the DG disc that was issued in 2000 and which contains two Easter cantatas, BWV 6 and BWV 66. It’s worth confirming that these are different recordings: the DG performances were taped in the studio in April 1999 – in other words, in advance of the Pilgrimage – and feature different soloists. Given that Easter is the greatest feast in the Christian calendar it may seem surprising that Bach left so little Easter music. Besides the pieces included here there’s only the so-called Easter Oratorio, BWV 249 and one other cantata, BWV158. It may be, as Alfred Dürr and other scholars have suggested, that Bach poured most of his creative energy into the composition of his Passion settings, leaving him little time or energy to compose for Easter as well. 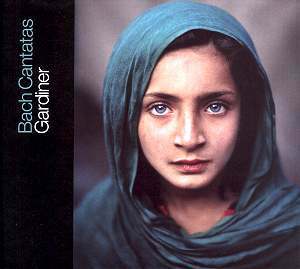 In fact, some of the Easter music included here was recycled by Bach from earlier secular celebratory cantatas that he had written in Cöthen and, in his characteristically eloquent notes, Gardiner opines that this was highly appropriate. However, whether recycled or not, the feast of Easter inspired some pretty marvellous music from Bach. BWV 4 is a very early work, probably dating from 1707. It’s both a chorale cantata – setting Luther’s famous hymn – and a choral cantata in that there are no soloists. It contains some splendid music and one fascinating aspect is the variety of ways in which Bach treats just one word, namely "Halleluja!" with which each of the seven verses concludes. Gardiner has recorded this work at least once before, a 1980 studio account for Erato. That’s a pretty impressive achievement but I think this new version is finer. Comparing the two readings the first chorus is a bit lighter on its feet in 2000 and I wonder also if a slightly smaller choir was used? The same degree of fervour is apparent in both performances but in the more recent performance we hear even more bite in the singing. At the end of this chorus Gardiner adopts a fast speed for the "Halleluja!" which gives a pell-mell effect. I can imagine this might raise a few eyebrows amongst those used to Richter, for example, but I find it exhilarating and I’m afraid Richter sounds staid by comparison. In the third verse of the hymn only the tenors are deployed by Bach and they, and the accompanying violins, are splendidly fiery in this latest performance. The fourth stanza follows without a pause, whereas there’s a tiny break between the movements on the Erato CD, which is a pity. That fourth verse is graphically presented here and in the following stanza the basses are quite outstanding. Overall this is a gripping account of the cantata. In Gardiner’s hands the music has a tremendous degree of drama, which won’t surprise anyone who reads his stimulating note on the cantata. His 1980 version was very good but this new account eclipses it. BWV 31 (1715) is very different from BWV 4. In the earlier cantata the dark side of death had been to the fore. By contrast, BWV 31 is a much more celebratory affair. The opening sinfonia is resplendently scored with the inclusion of a festive trumpet choir. In the chorus that follows the Monteverdi Choir sings with tremendous verve and a real sense of jubilation. Their passagework is superb and for all the world it sounds like angels laughing. In the stalwart bass aria, ‘Fürst des lebens, starker Streiter’, I’m not convinced that Stephen Varcoe possesses quite the vocal weight that the music demands, though he sings stylishly. James Gilchrist, however, brings a splendid ringing tone and real presence to the recitativo that follows. In his aria, ‘Adam muss in uns verwesen’ he’s forthright and agile, as the music demands. The cantata also contains a lovely soprano aria, ‘Letzte Stunde, brich herein’ and Gillian Keith gives a touching account of it, well partnered by a delicious oboe obbligato. 1724 was the first year that Bach was based in Leipzig for Easter and on Easter Monday he unveiled BWV 66, using material recycled from a 1718 secular cantata, BWV 66a. The new Easter piece opens with a truly splendid chorus, which had been the final movement of the secular work. Soloists also play a part here, singing short duets, and they carry most of the burden of the central section of the movement. Stephen Varcoe sounds to be better suited to the dancing aria that he’s allotted in this work. Comparing this performance with the 1999 DG effort I marginally prefer Dietrich Henschel to Varcoe, finding the German singer to have a bit more character in his voice and stronger bottom notes. However, Gardiner and Varcoe impart more spring to the music in their reading of the aria so honours are about even between the two recordings. There follow two important movements, a dialogue recitativo and a duet aria, in which the alto and tenor soloists combine. The singing of Daniel Taylor and James Gilchrist is full of interest, although in the aria Taylor seems to be a bit too prominent at times. Again, comparing this aria with Gardiner’s 1999 reading I felt that the earlier version has just a little less of a spring in its step and though the 1999 soloists – Michael Chance and Mark Padmore – sound more evenly matched I think that on balance Taylor and Gilchrist, with a touch more spontaneity, take the palm. The inspiration for BWV 6 is the passage in St. Luke’s Gospel that tells of the encounter between the risen Christ and some of his disciples on the road to Emmaus. In his note Gardiner speculates that in writing the opening chorus of BWV 6, with its tone of "tender pleadings", "you sense that Bach had the final chorus of his St. John Passion, if not on his writing desk then still ringing in his ears." I confess I’d never made this connection before but it seems so obvious now. This marvellous music is magnificently performed here. Daniel Taylor acquits himself very well in the fine aria, ‘Hochgelobter Gottessohn’ and the player of the oboe da caccia obbligato also excels. Similarly to be admired is the player of the violoncello piccolo obbligato in the chorale movement that follows. The melody here falls to the sopranos of the Monteverdi Choir, who deliver it with chaste purity. The cantata also contains a plangent tenor aria, which is expressively sung by James Gilchrist. BWV 134, which dates from 1724, may not be as well known as, say BWV 4 or BWV 6 but it’s actually a superb piece. It contains music originally composed for a Cöthen cantata to celebrate New Year’s Day 1719. The featured soloists are the alto and the tenor and they have rewarding parts to sing. There is, for example, a joyous tenor aria, ‘Auf! Glaübige, singet die lieblichen Lieder’ of which James Gilchrist gives an exhilarating performance. The accompaniment features a pair of busy oboes and strings and the scoring imparts a real feeling of a bright spring morning. The duet recitativo is vividly delivered by the two soloists and then they combine in a super aria, ‘Wir danken und preisen dein brünstiges Lieben’. Taylor and Gilchrist sing this most delightfully; it’s a winning performance. The closing movement unites soloists and chorus in the manner of the opening movement of BWV 66. This is a jubilant movement, which is done here with splendid assurance and real élan. Finally, a brief cantata, BWV 145, which is thought to date from 1729. It’s possible that Bach prefaced this cantata with an instrumental movement or a chorale. There are only two movements of significant dimensions. One is a duet between a tenor soloist, as Jesus, and a soprano (the soul). Gilchrist maintains his fine form while Angharad Gruffydd Jones displays a clear, sweet timbre that’s most attractive. The piece also includes a sprightly bass aria, which is well taken by Stephen Varcoe. There’s some magnificent music here and, once again, the Pilgrims’ performances are first rate. James Gilchrist is the pick of the soloists, though all his colleagues also give a great deal of pleasure. The singing of the Monteverdi Choir is quite superb and the orchestral playing is no less fine. As ever John Eliot Gardiner proves to be an expert guide to the music, whether he’s (figuratively) wielding his baton or his pen. The sound is excellent. Collectors of this wonderful series need not hesitate. The people of Eisenach were surely treated to a marvellous millenary celebration both of Easter and of their city’s most illustrious son and we can now relive the occasion thanks to this splendid pair of CDs.